Xiaomi launched its mid-range device with Mi Max 2 with 64GB internal storage for a Rs.16,999/-July in India and now we have the cheaper version of the same device with lower storage option with Xiaomi Mi Max 2 4GB+32GB version in India.The device is priced at Rs.12,999/- and will go on sale starting from Sept 20 exclusively on Amazon for Prime members only, Mi Home outlets and Mi.com.The actual price for the 32GB version of Mi Mix 2 is Rs.14,999/- but the device will be available for lower with Rs.12,999/- and we are not sure about for how long the device will be available at that price. Mi Max 2 is completely built out of metal this time and there are antenna bands running all the sides at the back of the device similar to what we found on iPhone 7.The Xiaomi Mi Max 2 is having a 6.44 inches FHD 1080p display with 450nit brightness and 72% NTSC color gamut.There are no details of any kind of protection used for such a huge screen.It weighs about 211 grams and is 7.6 mm thick. The Mi Max 2 is powered by SD 625 with 4GB RAM and 64GB inbuilt storage with a microSD card slot for further expansion of storage up to 128GB. All this is fueled by 5,300 mAh mammoth battery which is the highlighting factor for this device and it supports Quick Charge 3.0 out of the box. As far as the camera is concerned Mi Max 2 comes with 12MP Sony IMX386 sensor rear camera with an aperture of f/2.2,1.25 micron large pixel size, Dual Tone LED Flash & PDAF.The selfie camera is of 5MP with an aperture of f/2.0 and 85-degree wide angle lens.Rear camera supports 4K video recording at 30fps and 720p slo-mo @ 120fps.The connectivity options include Dual SIM 4G VoLTE support, Bluetooth 4.2, Dual Band Wifi, GPS, IR Blaster at the top, USB Type C port at the bottom and fingerprint sensor at the back.Please note there is no 3.5 mm headphone jack this time instead Xiaomi is providing a USB Type C to 3.5mm audio connector in the box.It also comes with Stereo speaker similar to Mi 6. 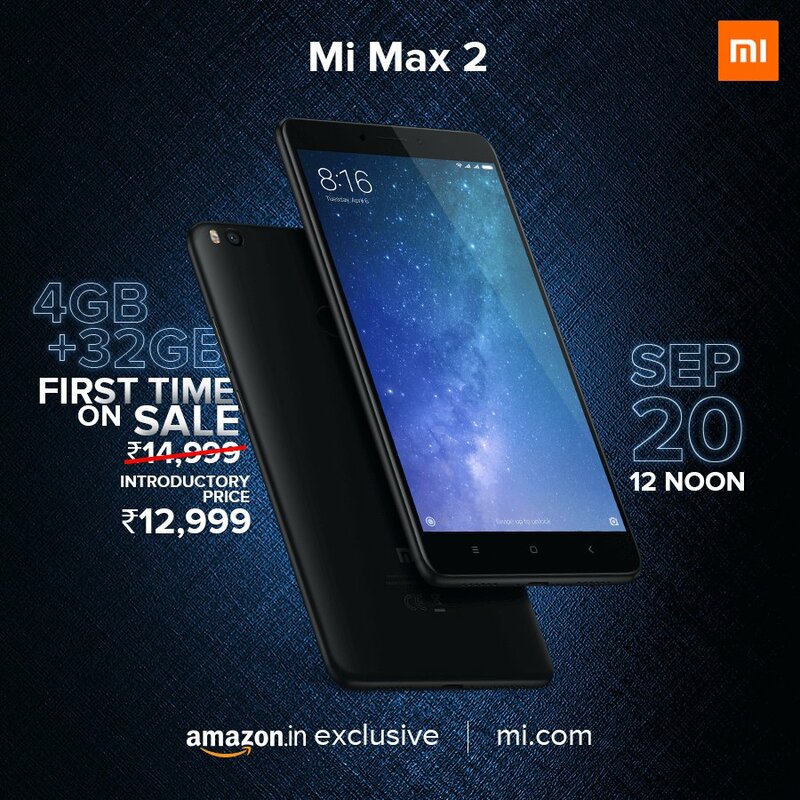 So would you like to buy the new Xiaomi Mi Max 2 32GB version for Rs.12,999/- over the Redmi Note 4 which s priced at Rs.11,999/- for 4GB+64GB version? Do leave your thoughts in the comment section below.